Western blot analysis of extracts from DU 145 and LNCaP cell lines using UCHL1 (D3T2E) XP® Rabbit mAb (Biotinylated) (upper) and β-Actin (D6A8) Rabbit mAb #8457 (lower). 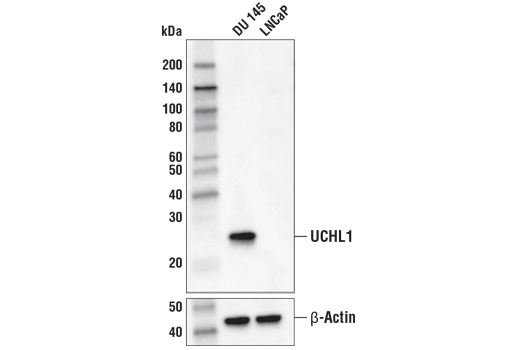 UCHL1 (D3T2E) XP® Rabbit mAb (Biotinylated) recognizes endogenous levels of total UCHL1 protein. This antibody does not cross-react with other UCH family members. Monoclonal antibody is produced by immunizing animals with a synthetic peptide corresponding to residues near the carboxy terminus of human UCHL1 protein. This Cell Signaling Technology antibody is conjugated to biotin under optimal conditions. The biotinylated antibody is expected to exhibit the same species cross-reactivity as the unconjugated UCHL1 (D3T2E) XP® Rabbit mAb #13179. Protein ubiquitination and deubiquitination are reversible processes catalyzed by ubiquitinating enzymes (UBEs) and deubiquitinating enzymes (DUBs) (1,2). DUBs are categorized into 5 subfamilies: USP, UCH, OTU, MJD, and JAMM. UCHL1, UCHL3, UCHL5/UCH37, and BRCA-1-associated protein-1 (BAP1) belong to the ubiquitin carboxy-terminal hydrolase (UCH) family of DUBs, which all possess a conserved catalytic UCH domain of about 230 amino acids. UCHL5 and BAP1 have unique, extended carboxy-terminal tails. UCHL1 is abundantly expressed in neuronal tissues and testes, while UCHL3 expression is more widely distributed (3,4). Although UCHL1 and UCHL3 are the most closely related UCH family members with about 53% identity, their biochemical properties differ in that UCHL1 binds monoubiquitin and UCHL3 shows dual specificity toward both ubiquitin (Ub) and NEDD8, a Ub-like molecule. UCHL1 (PGP 9.5/PARK5) functions as a deubiquitinating enzyme and monoubiquitin stabilizer. In vitro studies have demonstrated that UCHL1 can hydrolyze isopeptide bonds between the carboxy-terminal glycine of Ub and the ε-amino group of lysine on target proteins. UCHL1 is also involved in the cotranslational processing of pro-ubiquitin and ribosomal proteins translated as ubiquitin fusions (5-7). Mice deficient in UCHL1 experience spasticity, suggesting that UCHL1 activity is required for the normal neuromuscular junction structure and function (5-7). Research studies have described loss of UCHL1 expression in numerous human malignancies, such as prostate, colorectal, renal, and breast carcinomas. Investigators have shown that loss of UCHL1 expression in breast carcinomas can be attributed to hyper-methylation of the UCHL1 gene promoter (8). While loss of UCHL1 expression is implicated in human carcinogenesis, mutation of UCHL1 has been implicated in neurodegenerative diseases such as Parkinson's and Alzheimer's (6,7). Nijman, S.M. et al. (2005) Cell 123, 773-86. Nalepa, G. et al. (2006) Nat Rev Drug Discov 5, 596-613. Leroy, E. et al. (1998) Nature 395, 451-2. Kurihara, L.J. et al. (2001) Hum Mol Genet 10, 1963-70. Todi, S.V. and Paulson, H.L. (2011) Trends Neurosci 34, 370-82. Setsuie, R. and Wada, K. Neurochem Int 51, 105-11. Day, I.N. and Thompson, R.J. (2010) Prog Neurobiol 90, 327-62. Xiang, T. et al. (2012) PLoS One 7, e29783.